The buildings on the present main college site were built principally by three generations of the Waterhouse family. Alfred Waterhouse, a prominent Victorian exponent of Neo-Gothic, started in 1873 with Old Wing, the North Side of Emily Davies Court. A. Waterhouse is responsible for other buildings in Cambridge (Pembroke Library, Caius Tree Court), and many others elsewhere, notably Manchester Town Hall. The style used was his characteristic Neo-Tudor in red brick and terracotta. He introduced the corridor plan — rooms arranged along a corridor rather than as a vertical stack accessible from a staircase. This style was taken up by many of the residential college buildings built subsequently in both Oxford and Cambridge. Library of Congress site. Library of Congress Prints and Photographs Division Washington, D.C. 20540 USA. Viewed 11 February 2009. 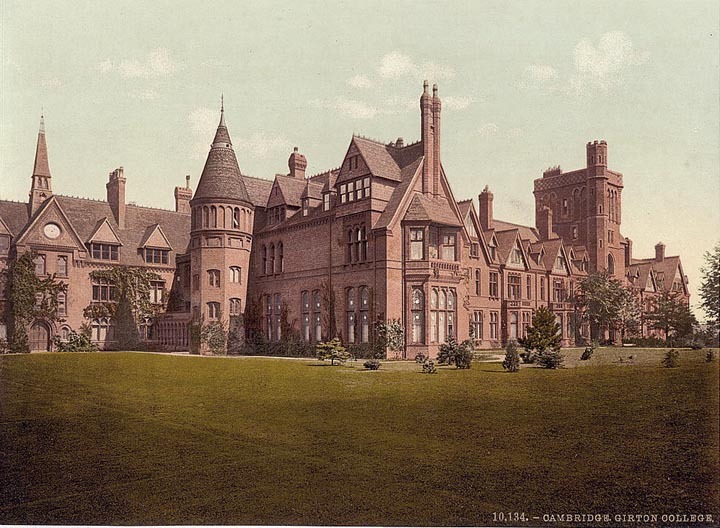 Girton College Architecture. Girton College site. Viewed 11 February 2008.